HostPapa Sitebuilder Review: A Brilliant Builder But Is It Worth It For You Business? 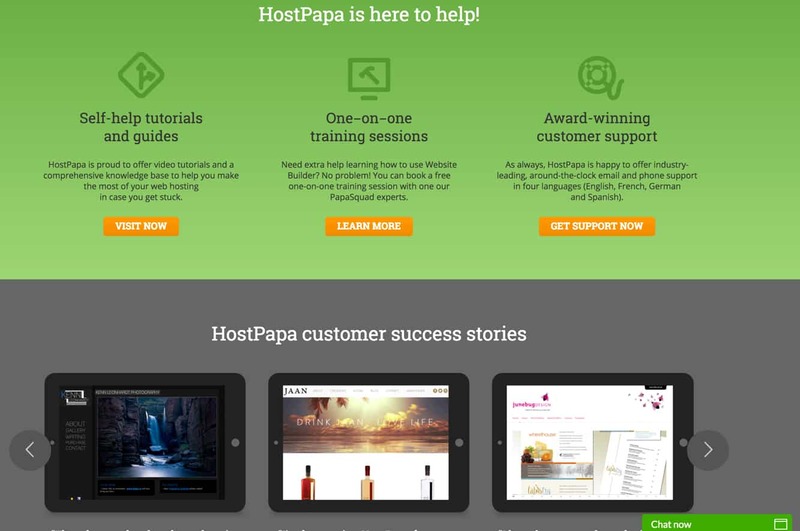 HostPapa Sitebuilder Review: The Grand Daddy of Them All Or Papa don’t Preach? 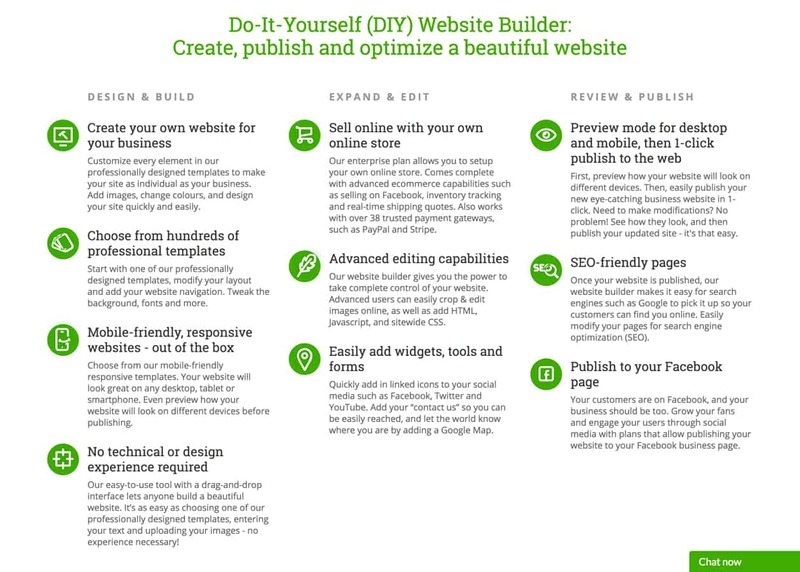 Looking for a DIY website builder? Need one-on-one site coaching too? Read our review of the HostPapa Website Builder to see if it’s right for you. 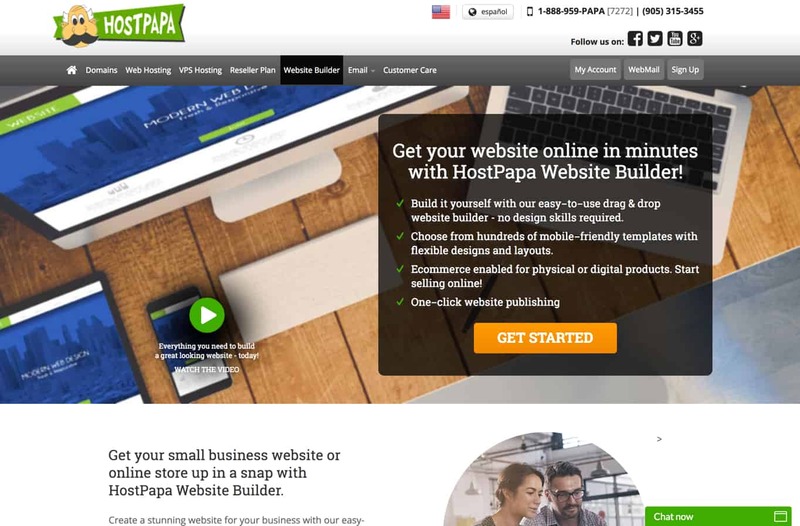 The HostPapa Website Builder is aimed at small businesses looking to develop their online presence and get their websites off the ground as quickly as possible with as little trouble as possible. HostPapa boasts that you can have a live site within minutes, though it’s full-featured, easy-to-use editor means that you can spend just a bit more time to create something that matches your aesthetic and promotes your business accordingly. So How Does The Website Builder Work? What are the Top Features of HostPapa? What Kind of Help and Technical Support is Available? Is HostPapa’s Website Builder Right for You? What are the Pros and Cons of HostPapa’s Website Builder? HostPapa offers their 500,000+ customers (typically small businesses) full-featured shared and VPS hosting packages, as well as several reseller options. Their goal is to provide plans that are low in price, yet high in value — the company promises that you can get your website live in minutes. All packages come standard with a free domain name, drag-and-drop site builder so that you can build a professional-looking site even without design experience or technical knowledge. Further standard inclusions include secure email, unlimited allocations of resources (such as storage and bandwidth), and a control panel and proprietary dashboard to make managing your site uncomplicated. They also offer additional services, such as web design, SSL certificate sales and assistance with implementing security and encryption features, and assistance with integrating productivity suites such as G Suite or Microsoft Office 365. The HostPapa site builder landing page. They offer a 30-day money back guarantee if you’re unsatisfied with the package you’ve purchased (less the cost of domain registration and any services that you’ve added to your hosting package). Before we go over HostPapa’s website builder, we must note that this product only works with and is offered to those whose domains which have registered their domains with HostPapa. If you don’t already have a HostPapa-registered domain, you can either transfer your domain over before using the website builder or sign up for a new hosting package (all come with one free domain). Additionally, if you have multiple domain names associated with your account, and you want to use the website builder with each domain name, you’ll need to pay for an instance of the website builder for each domain. HostPapa’s website builder is a subscription-based, full-featured, drag-and-drop editor that allows you to build a professional-looking, mobile-friendly website without requiring any programming/technical knowledge. You do not need any design experience to create an impressive layout. You can choose from any of the hundreds of pre-built design templates on offer. With a template in place, you can then customize it to suit your needs and aesthetic preferences. The entry-level plan comes with 120 design templates, and this increases to 230 templates on the top-tier plan. Hostpapa’s website builder also provides options for entrepreneurs with some experience, and you can customize your site. Publish it on the web under your domain. The HostPapa website builder is a tool that’s easy to use for those who have never seen a line of HTML, yet powerful enough that seasoned web development pros could use it. Regardless of whether you start from scratch and “build” your site using the drag-and-drop features, choose a template that you customize to your needs, hand-code elements, or use some combination of all of the above, you can have a professional-looking site up and running in no time. You control every part that appears on your site, and the website builder takes care of the rest (right down to coding your site in a way that maximizes your search engine rankings). With the increasing number of people accessing sites using their mobile devices, having a mobile-friendly website isn’t optional anymore — it’s mandatory. The HostPapa Website Builder offers many mobile-ready site templates that you can use, so you don’t have to worry about optimizing your site for the array of devices in use today. If you choose to upgrade to the Enterprise version of the website builder, you’ll get access to e-commerce tools that allow you to get your online store set up quickly and easily. A video tutorial by HostPapa on setting up their e-commerce functionalities. In addition to sales integration with sites like Facebook and inventory management functionality, you get the ability to use trusted payment gateways such as Stripe and PayPal. For those who are looking to build a complete online store, we recommend upgrading to the Enterprise version of the website builder. With this version, you’ll get access to a full suite of e-commerce tools that allow you to set up everything you need to conduct business using your site. Features include sales integration with sites like Facebook, inventory management functionality, and integration with trusted payment gateways such as Stripe and PayPal (if you prefer using another payment processing vendor, HostPapa supports 36 other companies). You can easily add widgets, tools, and forms, which increases the functionality and usefulness of your site. For example, you can add widgets linking to your Facebook, Instagram, Twitter, and social media profiles so that people can find you on other platforms. Add forms so that people can contact you directly or sign up for your email subscription list. Add location information by embedding Google Maps onto your page to make it easy for people to find your physical storefront or event. Use template or text box widgets to add footers, new content boxes, and other design elements to change the look and feel of your site. Again, this is all done without any coding knowledge on your part. When you’re ready to publish, you can preview your page as it appears on a broad range of devices (from smartphones to desktop computers). This allows you to determine ahead of time if the site you’ve built works as well for those viewing it on the smallest smartphone as it does for those using jumbo-sized monitors hooked up to the desktop machine. If you need to make any design changes, you can do so and quickly update the preview and review your changes immediately. When you’ve finished building or updating your site, you can publish your updated site design to your HostPapa-hosted site or your Facebook business page with just one click. A unique aspect of HostPapa is they offer a free 30-minute coaching phoner to help you with your website build. HostPapa prides itself on offering a wide variety of resources to assist you if you ever have a question or run into an issue. HostPapa’s FAQ section, comprehensive knowledgebase and extended series of video tutorials are great places to get started or to look up the answer to your questions quickly and easily. Not only do they publish guides on the topics that people request help for most often, but HostPapa also provides tips and tricks for developing the best possible site. They’ve documented their products and collected those materials into developer guides that you can use to implement something. You can certainly look for individual topics and piece together knowledge on your own, but for beginners, you can start with tutorials that help you implement a whole process, such as creating an integrated pay-and-download feature for paid content you’re selling. However, if the knowledge base and video tutorials aren’t enough and you need additional assistance in building your site, you can request one-on-one training sessions with one of the experts with the PapaSquad. These sessions are 30 minutes long and are free of charge to you. For more generalized support help, you can contact the support line 24/7, where experts are available to help you (in four languages to boot: English, French, German, and Spanish). You can reach the HostPapa support team via live chat, email, or phone, or you can open up a ticket in the support center. The Starter Plan comes standard with all shared web hosting packages free of charge. You can design up to three pages, have access to 120 different design templates (including mobile-friendly, responsive ones), and can edit the HTML for any of your pages. You get 25 MB of disk space for your pages. The Unlimited Plan, like the Starter plan, comes with access to 120 different design templates (some of which are responsive and mobile-friendly). You can edit the HTML for any of your pages, but you aren’t limited to designing and building just three pages — you can build as many pages as you want. You get 2 GB of disk space for your pages, which is considerably more than the allocation given to those with the Starter plan. 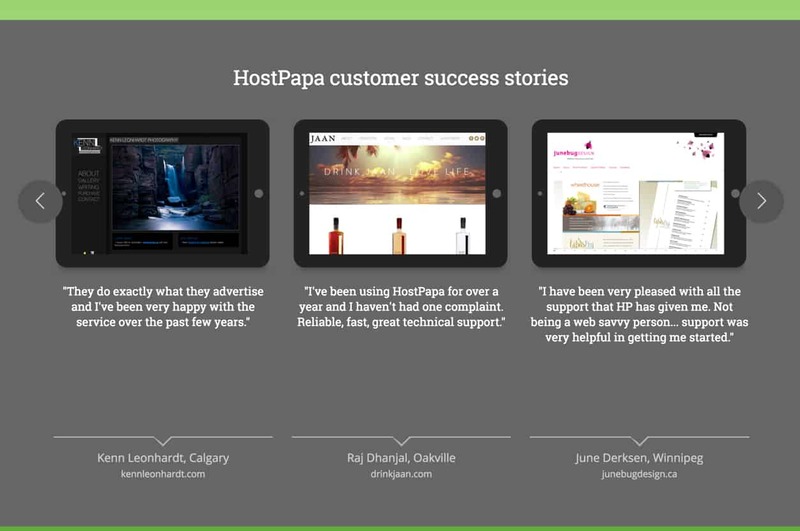 Visit the HostPapa site to read success stories from business owners who created and launched their websites with HostPapa’s tools. The Premium Plan includes the ability to build an unlimited number of pages using any of the over 230 different design templates (including mobile-friendly, responsive ones) available. You can edit both the HTML and CSS for your pages, publish your new design to your Facebook business page with just one click, and add tap-to-call, Google Maps, and office hours information to the mobile version of your page. You are allocated 5 GB of disk space for your pages. The Enterprise plan builds on the Premium Plan. You can build an unlimited number of pages using any of the over 230 different design templates (including mobile-friendly, responsive ones) available. You can edit both the HTML and CSS for your pages. You can publish your new design to your Facebook business page with just one click. And you can add tap-to-call, Google Maps, and office hours information to the mobile version of your page. The biggest difference between the Premium and Enterprise plans is that the latter includes e-commerce features. Anyhow, it’s useful to compare the two top-tier plans to the rest. While the widgets included with all plans offer basic e-commerce functionality (for example, you could implement a basic checkout by adding the PayPal widget), the e-commerce features allow you to set up a full store, including product pages, inventory management functionality, shopping cart, checkout, and shipping calculators. Uploading photos, audio files, and video clips are a breeze. You are allocated 10 GB of disk space for your pages, which is particularly useful if you have a lot of high-resolution images and demonstration videos for the products you’re selling. As we stated above, the website builder is not a standalone product: it’s an add-on to a web hosting package where the domain is managed by HostPapa. When you purchase a hosting package, you’ll be shown a monthly rate, but this is the rate you’d get if you signed up for a three-year contract. HostPapa offers contracts that last one, two, or three years, and the longer your contract, the lower your overall monthly rate will be due to the associated discounts. You have to pay upfront at the time of purchase for the entirety of your contract. Because the upgraded versions of HostPapa Website Builder are hosting package add-ons and because you’re required to pay for hosting packages one, two, or three years up front, you’ll also have to pay upfront for the website builder. It’s interesting to note that the top-tier website builder package, the Enterprise Plan, ends up costing more than the most expensive shared hosting plan (even if you don’t receive a discount on your monthly hosting fees) on a month-to-month basis. This cost is something to take into consideration if you’re on a limited budget, yet you want a full-featured online store associated with your site. If you’re not sure which plan is the best fit for you, you can always choose to begin with a lower-tiered plan. If you discover that the plan you’ve chosen isn’t meeting your needs, you can easily upgrade to a higher-tiered plan at any time using your HostPapa dashboard or by contacting a HostPapa customer service associate. While HostPapa offers a 30-day money back guarantee for hosting packages, but it’s unclear whether the website builder comes with any guarantee at all. There are many easy to use drag and drop website builders to choose from. To find the best fit, you need to determine your needs – and budget. Wix and Weebly are popular site builders, and both come with free plans so you can test the platform before your commit. Squarespace is also known for its easy user-interface. If you’re after a reasonably-priced and feature-rich website builder, it might be worth checking one of those site builders out. If you’re looking to have more control over your website, using a content management system like WordPress is a better option, though it has more of a learning curve than website builders. In that case, look into a web hosting company known for WordPress hosting like Bluehost and SiteGround. Both of those hosts also come with access to site builders as part of the hosting plan you sign up for. If you’ve purchased a hosting package from HostPapa and have the option of adding their website builder to your account, this an excellent way to build a professional-looking website without devoting a significant amount of time and resources to teaching yourself the necessary design principles and technical skills. Even if you’re well-versed in the world of web development, you can still use the website builder to get up and running in no time, leaving you to work on other business-related tasks. The only downside is that this is not a standalone product. Only those with a HostPapa hosting package can even consider adding this feature to their packages (and those with multiple domains associated with their accounts need to purchase multiple instances), and even then, the fees for the product are assessed on a monthly basis. While we can see the merit of charging for the use of the product, it’s a bit harder to swallow the fact that you have to pay for it on a monthly basis. This, combined with the fact that you have to pay for fees upfront for one, two, or three years of service and that there’s no stated guarantee could make this website builder a somewhat risky option. If you’re on a budget and you’re looking to get going with a simple site and with as little fuss as possible, we recommend looking through this option with HostPapa carefully. Here’s a wrap on the positives of HostPapa plus a few potential cons. Access to hundreds of design templates, even on the entry-level plan. Free 30-minute training sessions to help you get the most of the site builder. This is a great offering if you’re just starting out with website building. Higher end plans have easy integration with Hostpapa’s online store builder and applications like Facebook. Support offered in multiple languages and access to live chat. Hostpapa’s cPanel is easy to navigate with a search bar at the top so you can quickly find different functions. You must pay upfront for the hosting package (and site builder). This could be expensive for small businesses. It’s not a standalone product so you’ll have to sign up for a hosting plan first. You are here: Home > Web Hosting: Which Hosting Company Is Best For You & Your Website? 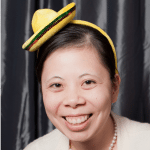 > HostPapa Sitebuilder Review: The Grand Daddy of Them All Or Papa don’t Preach? Our Verdict: Green hosting for growing sites. Previous: BigRock Review: Big In India – Right For You, Too? Next: Canadian Web Hosting Review: Canucks-Only, Or A Good Bet For All?